Farrier Blacksmith Horseshoer Print by LAJOS MARKOS The image size is 25" wide x 20" tall, with a white border making the paper size 29" wide x 24" tall. This Limited Edition, Signed print is brand new, has never been displayed and comes from a smoke-free building. This is a signed and numbered limited edition of 950. We have been informed by a sharp-eyed collector that in fact these prints were actually signed by Markos' wife, AFTER his death. So this was likely one of his later works. The print is authentic, however, and bears the Heritage West Gallery publisher's embossed insignia. This is an amazing piece. It is has been done so well, that can almost feel the chill in the air when you look at this piece. You can see the Western Blacksmith / Farrier busy at work in front of his shop, with other horses waiting their turn. 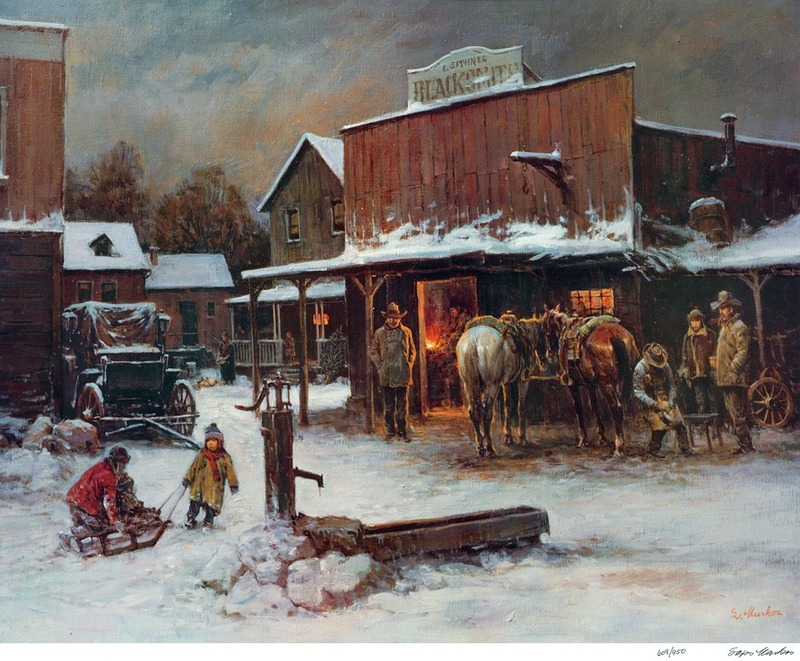 A glowing fire can be seen inside the blacksmith's shop and t are children out playing in the snow. highest national Hungarian prize for fine art. In 1951 he moved with his family to the United States w he lived in Texas. He became acclaimed for his historical and Western paintings.